Marie Antoinette was born in Vienna in 1755 as archduchess Maria Antonia Josepha Johanna of Habsburg-Lothringen, daughter to Maria Theresia and Emperor Francis I. In 1770, she was married to the French Dauphin and future king Louis XVI, to manifest a political liaison that had been vigorously pursued by both countries to form a coalition against Prussia. In his book, Zweig focuses on the woman who was queen and on the judgment that she faced by her contemporaries. Tried by the Revolutionary Tribunal, Marie Antoinette was convicted, sentenced to death and eventually executed by the Guillotine in 1793. It is not easy to rate this book from the viewpoint of a historian. Zweig’s biography has reached great popularity, not only for its topic but also for its masterful language. It is well researched especially on the level of personal correspondence between the featured personages. The book, albeit not the work of a historian, has had a considerable influence on historical fiction and scientific writing ever since. Zweig was a novelist with a PhD in philosophy, known for his analytical character studies, regularly submitting his personages to a thorough psychological analysis. He is famous for the melancholic atmosphere of his works and his tragic protagonists trapped between humanity and human cruelty. His work shows a man not only in search for himself but with a deep insight into the world around him and a need to grasp the changes of said world that left him in a deep shock, expatriated from his beloved homeland and that eventually contributed to his suicide. He remains without question one of the most accomplished writers of modern Austrian literature. Stefan Zweig’s biographies are therefore rather a work of literature than scientific analysis. They reflect Zweig’s subjective interpretations but pay tribute to his deep knowledge of human nature. Among them, Marie Antoinette is particularly interesting in retrospect of Zweig’s own connection to monarchic Austria. As a Jew growing up in the Austrian-Hungarian Empire, he was very skeptical of the political changes after its downfall and developed a nostalgic view of the old world where the Emperor had held his protective hand over the cultural and ethnical variety. Already the title catches the eye and gives food for thought. When Zweig describes Marie Antoinette as an average woman, he does not attribute her overly negative character traits. In his narration, she is not unintelligent, hypocritical, ill-natured or overly condescending. Zweig simply stretches the fact that she was unprepared and by nature of her character also unfitting for the responsibilities that should arise from the economic and political circumstances within France. Zweig does not hide Marie Antoinette’s personal shortcomings but describes her in all the authenticity of her character. She is not a studious character, trying to avoid her more tedious duties wherever she can, charming her way out of them. According to Zweig, she lacks the perseverance for more responsible endeavors. She is described as a woman caught between a carefree, fun-loving and slightly irresponsible child and the role as queen, the importance of which she never really cared to grasp. She is lost in the court intrigues, thrown into the lion’s den at the age of fifteen, not knowing who to trust and eventually relying on the wrong people who would abuse her friendship and ruin her reputation in the public eye. In that way, Zweig shows Marie Antoinette as a political pawn, forced into a role that, because of her personality, she was unfit to fulfill, yet by no fault of her own. He does not judge Marie Antoinette in the light of history, he merely analyzes her character and actions within the world and the circumstances surrounding her, very much like in a play. Unlike many biographers before him and some after him, Zweig does not try to hide the relationship between Marie Antoinette and Graf Fersen or describe it as an innocent friendship. He fully grants the queen who is trapped in a marriage of political convenience her right to a fulfilling love life. Zweig is appalled at the insinuation that Marie Antoinette should be accused of having tried to conceal the relationship out of fear and false sanctimoniousness. She, who had never been a coward and never allowed any convention to break her will. According to Zweig, Marie Antoinette’s greatest mistake largely contributing to her downfall was that she mingled into politics without understanding it or being interested in it. She merely did it to distribute favors, to satisfy her courtiers and perhaps, like in a childish game, to prove to them as well as to herself the power and influence she held over her husband. Zweig implies that as a female royal consort, Marie Antoinette did not achieve the extraordinary. She did not guide her husband in a way that might have prevented the revolution. Yet, it was the revolution that brought this fact more to light than anything else. After all, so Zweig, Maria Theresia did not want her daughter to mingle into public affairs. If criticism would arise, Maria Theresia would have preferred for it not to fall upon her daughter but on some minister, who could be held accountable. Zweig portrays the queen as the maker of her own fate but stresses that she is mostly a victim of circumstances. Those circumstances were beyond her control and understanding and to a certain extend also beyond her care. Yet, in her darkest hour, when she is personally attacked and under scrutiny, she shows her strength and dignity. Zweig does not fail to mention that even certain members of royalty used that opportunity to settle a personal account with Marie Antoinette. In this moment, Zweig portrays her more as a queen than ever stating that beside all her shortcomings, she possessed incredible courage. The revolutionary trial against her is a sham, attempting to frame Marie Antoinette in the most appalling manner. Yet, she proves her wit and escapes all judicial subtlety and calculation. When she is asked by the judge if she regrets that the right of the people have cost her son the throne, she responds that she would never regret anything for her son if it served his country. Zweig salutes Marie Antoinette for not opening herself to the attack while at the same time emphasizing her son’s birthright and the role of the Monarchy by calling France “his” country. This scene gives an interesting insight into Zweig’s own state of mind. This is perhaps less a proof to reveal Zweig as monarchist but rather shows his disgust with the French Revolution and his refusal to see it as a glorious event. He underlines the cruelty of public opinion that shamed the royal family with the worst kind of propaganda. Zweig might have written those passages reflecting upon his own experiences with the power of such vilification over the public mind. Zweig, although far from calling Marie Antoinette an exemplary queen, does not judge her in the retrospective of post-monarchist democratic politics. He focuses on his portrayal of a woman faced with the inhumanity of her judgment and her judges. In that sense, Zweig stays true to one of his leading topics. In doing so, he naturally becomes apologetic of Marie Antoinette and somehow glorifies her image. Zweig is undoubtedly subjective but he looks at the historical background from a point of view that is in itself fascinating and worth reflecting upon. He wrote the biography on Marie Antoinette in 1932, about 140 years after her death but within this comparatively short time, the world had seen incredible changes. Stefan Zweig uses Marie Antoinette for his own reminiscence of a past that was to him irrevocably lost, while facing a future he was not looking forward to. The comparison of the terror of the French Revolution with the terror that was yet to come in Zweig’s own country and that he partly anticipated, shows his inner turmoil. As such, the novel is in some way equally a testimony to Zweig’s own time which creates an interesting multifaceted nature. Zweig has been criticized for writing a pamphlet of redemption, portraying the queen as a victim of her circumstances, giving future writers a justification for a similar romantic notion culminating in publicized fiction like the film by Sophia Ford Coppola. A historian might consider himself an apt critic of such work but it might also lead him to reflect upon his own scientific judgement. Finally, critical observations aside, the writing itself is nothing but superb and clearly shows Zweig’s mastery of the German language which makes the book a pleasure to read. 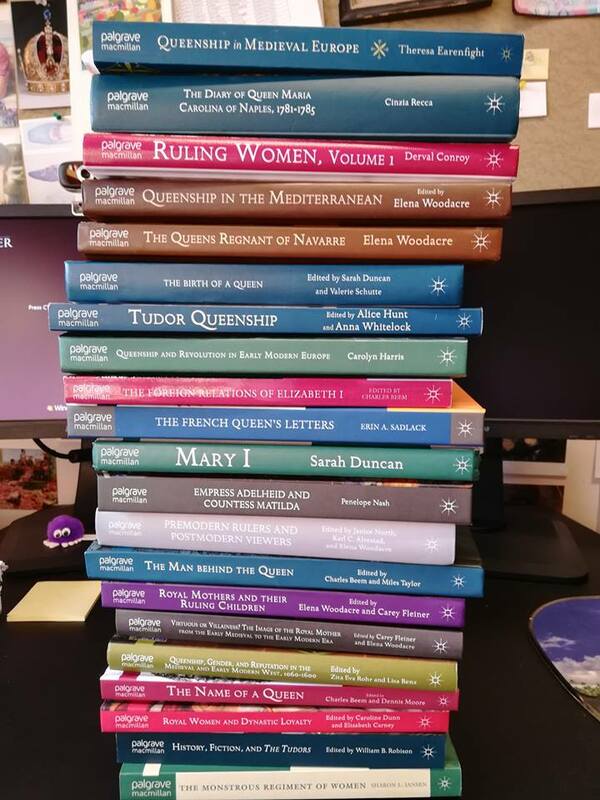 This month, we’re celebrating an incredible book series in our feature “Book of the Month”: The book series Queenship and Power (Palgrave Macmillan) celebrates its 10th birthday this year! Time to look a bit deeper into the series, and commemorate the books and research. The Royal Studies Journal Blog was lucky enough to get the chance for a chat with Carole Levin and Charles Beem, the editors of the series. RSJ Blog: Thanks Carole and Charles for giving us the chance for some discussion of your book series. And congrats for your 10th anniversary! 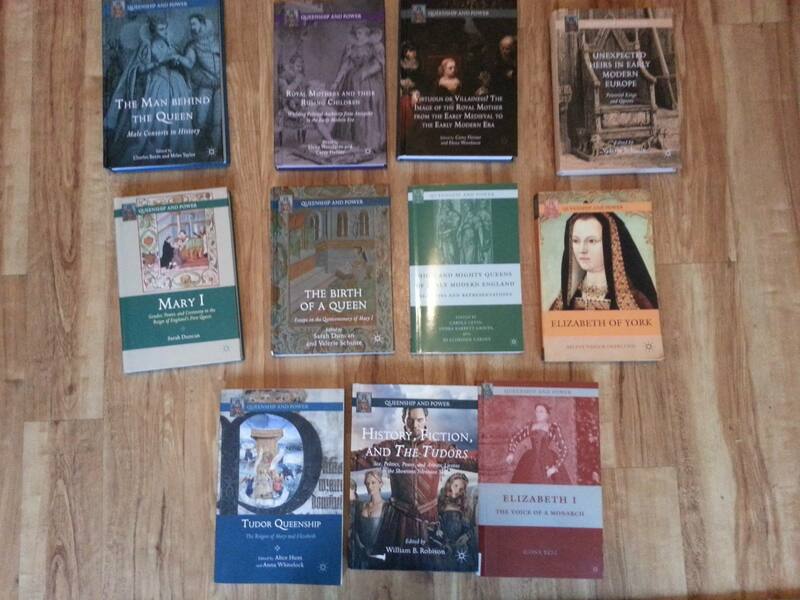 Already 56 books are published – that is amazing, and really brought research on queens and queenship forward. Could you please start by telling us a bit more about the time 10 years ago? How did you come up with the idea, and what were your first experiences? Carole: The idea for the series was mine and I knew that for something like what I envisioned, I was to work collaboratively. I had read The Lionness Roared for Palgrave and thought it was wonderful and when I met Charles I knew he was the one with whom I wanted to co-edit the series. It was a brilliant decision. Working with Charles has been just wonderful and the series has been more than I could have imagined at the time. Charles: I was thrilled to have been asked to do this series with such a distinguished scholar as Carole, whose work I had long admired. The series proposal itself was the first of many collaboration between us as we conceptualized the mission and scope of the series. The project had a longer gestation with Carole, who knew so many junior scholars getting ready to publish their first books. I really had no expectations, and I do not think either of us had any inkling of how successful the series would be. One lucky break was the ability to work with our first acquisition editor, Christopher Chappell, for over five years, which allowed us to get a feel for working with the editorial and production staff at Palgrave. RSJ Blog: Can you tell us a bit more about the books published in the series? I also noted that a book from 2003 – so 15 years ago – is actually listed as part of the series. What is up with Carole’s, Debra Barrett-Graves‘, and Jo Eldridge Carney’s book on High and Mighty Queens of Early Modern England? Carole: Well, obviously I had been working on queens for a long time before the series – why I had the idea for the series – so our editor at Palgrave suggested that when the book came out in paperback it be part of our series. I was delighted to have it included. Charles: Palgrave had a few titles in their catalogue that had been published in hardback that were perfect for the series, which also included Sharon Jansen’s The monstrous Regiment of Women. So we acquired these and issued them in the series as trade paperbacks, to much success I might add. The Lioness Roared also, which was first published in 2006, was reissued in paper as the first title in the series. RSJ Blog: Charles, The Lioness Roared, the first „official“ book of the series was your monograph on the British queens throughout the centuries. In addition to inspiring much research going on right now, it is also a particularly longue durée study. How did you treat the challenges of this? Also, Carole and Charles, how was your experience with Charles as author and book series editor? Charles: My dissertation advisors tried very strongly to talk me out of this project. As an M.A, student, I wrote a history of English boy kings for my thesis, and was already intrigued by the possibilities of the long durée approach. The big challenge for me was mastering a number of historiographies, a process which greatly aided me as an instructor of British history. Carole: The book had been accepted for publication before the series so it was great to have it also start off the series. Charles had since done a number of other books for the series and I have always been so pleased to have him do so as his writing and editing are exemplary. RSJ Blog: While the book series has a focus on English, or British, queens and queenship, and especially the great Elizabeth I has been covered intensely, e.g. her writing, her Italian and foreign letters, her death and her life, her foreign relations, and – the newest – Elizabeth seen through French Valois eyes, the book series covers also lots of other European and some non-European queens. Was this something you pushed for, and encouraged scholars to look into it, or more of the other way round? Carole: When I first thought of the series I wanted it to cover as widely as possible both chronology and geographic range. 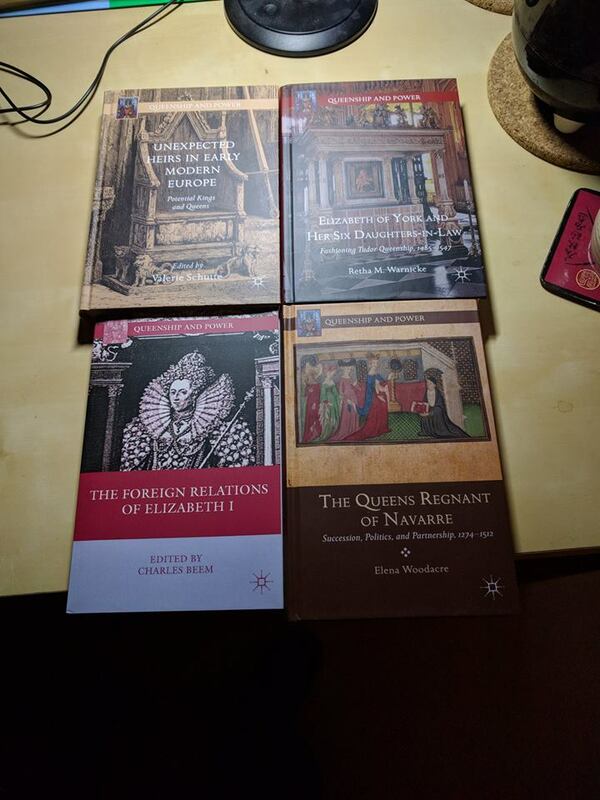 And as an Elizabeth I scholar I am delighted with the great works we have published that have had to do with her, I am equally thrilled by the range we do have in the series and would love to have even more. So yes, we are encouraging scholars to do excellent work in all fields of queenship studies. Charles: From the first, we conceptualized this series as global in perspective, although we anticipated that scholars of English and European queenship would be drawn to the series, which is in fact what happened. I would love to be able to publish works on Asiatic and African queens, as well as queens of the ancient and classical world. And Shelfie No. 3 proves that you might need more than one shelf for the series! 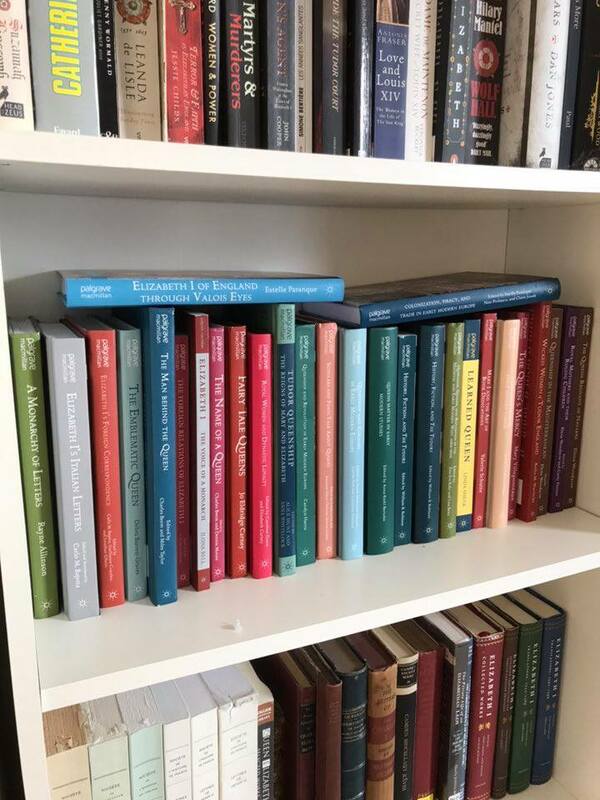 RSJ Blog: What I really enjoy about the book series is the mixture between young scholars just starting out, and established voices adding to this research field. Can you tell us a bit more about how you approach prospective authors and editors? Carole: I really love this about the series also! So Charles and I both talk to many scholars at conferences and really encourage young scholars to work with us so we can help them produce really fine work. And we are also so proud of the major scholars in the field who publish with us. Charles: Carole has an enviable network of scholars that literally stretches around the globe, and wherever she is, she always has time for a pitch. I have endeavored to follow in her footsteps, making time at conferences to chat with graduate students. Many of the conversations Carole and I have had over the years with graduate students and junior scholars were the catalyst for many books published in our series. RSJ Blog: One last question: what are your plans for the future? Especially regarding the book series, but also your other projects? Carole: Well, Charles and I are definitely planning to continue publishing a range of great projects in the series. And we are both continuing our various scholarly projects that deal with queenship. I am doing some projects on Queen Elizabeth and Boudicca – an essay on the topic is forthcoming in Estelle Paranque’s collection Remembering Queens and Kings. I am continuing to work on my creative projects as well and so is Charles. Charles: I am wrapping up revision for my next book Queenship in Early Modern Europe. I also have an essay on royal minorities in an upcoming edited volume on queenship and Game of Thrones, to be published late in 2019. Also next year I will begin the process of looking for scholars to contribute to a volume on ancient and classical queenship. RSJ Blog: These are great news! Especially, since we can now hope to get more performances on Kings & Queens conferences like 2018 in Winchester! And everybody reading this, and working either on African or Asian queens, or ancient and classical queenship: you know who to contact! There are some books which become so influential that there is just no getting around them. 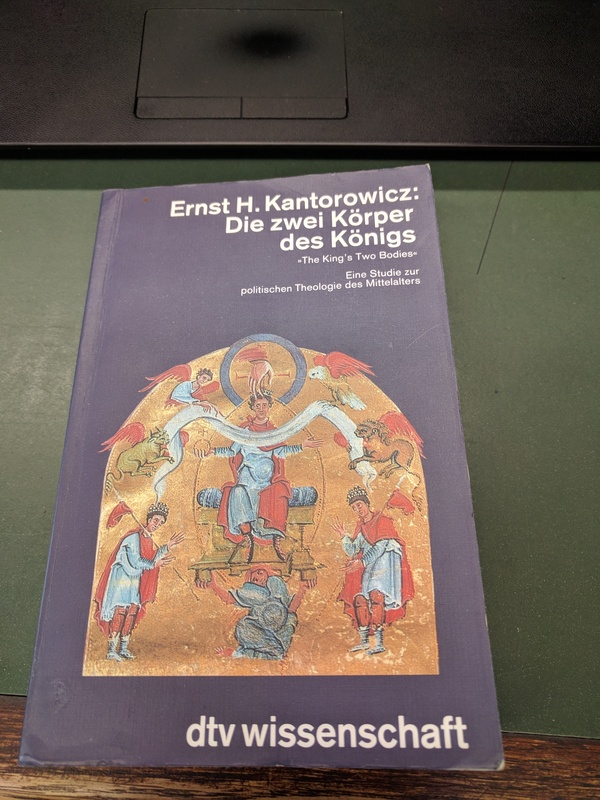 For researchers of royal studies and premodern political thought Ernst H. Kantorowicz’s book The King’s Two Bodies is one of them. Even if you’ve never read it, you certainly have heard about it, and maybe also used the main argument in your own work! What is the main argument of this book? Kantorowicz starts with a legal discussion under Elizabeth I’s rule about the lease of some lands under Edward VI who was still a child at the time in question. Kantorowicz uses Edmund Plowden’s Commentaries in which it is argued that a king has two bodies: a natural one (body natural) which still might be a minor, but also as king a political body (body politic) which is freed from all mortal and natural defects. Whenever the king acts with his body politic, no restrictions of his body natural are in force. Die zwei Körper des Königs. Did the King’s Two Bodies influence your work? Share with us your experiences, stories, and show us your copy of the book! You’ll find us on Facebook in the Royal Studies Group or email us under royalstudiesblog@gmail.com.